In 2016, I’m going to be taking photos of my recipe fails so I can compile them in a post. In 2015, I had many fails and several of them involved cheesecake! My first Cherry Cheesecake Pizza was going to be deep dish style. What happened with it was anything but edible. It looked cooked at first glance, but when I sliced into it, all hell broke loose. Another recent fail involved five packages of cream cheese. Yes, five. I almost cried at the money I wasted. It was a puddle of cheesecake goo. That’s life though. You learn from your mistakes. I made it my mission to never have those wasteful messes happen again. Well, that’s my plan, anyways. 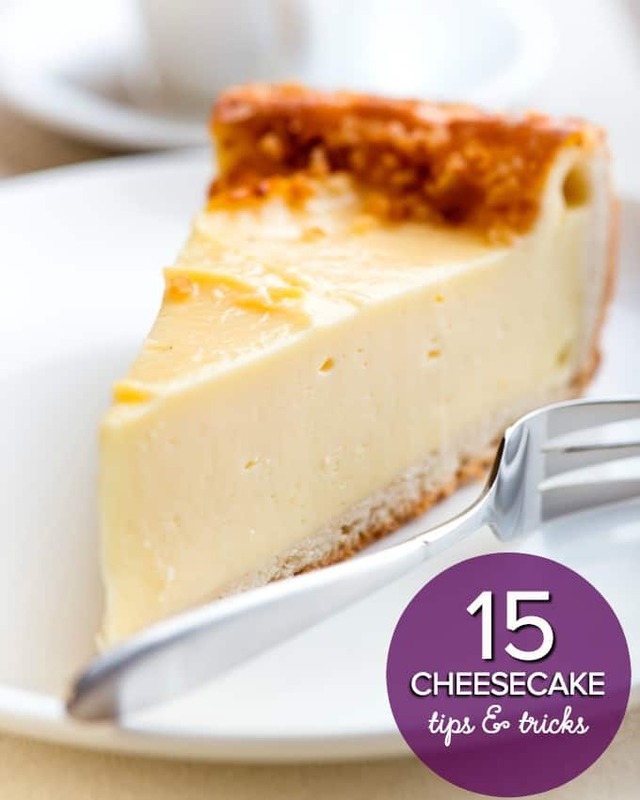 I’ve compiled 15 cheesecake tips & tricks to follow to help you prepare the best cheesecake ever. I cannot resist cheesecake and it’s one of my favourite desserts. I want to get it right and I’m sure you do too! 1. Eggs matter. To prevent cracks, add each egg, one at a time, about 15 seconds apart and mixing on low speed. Eggs trap air bubbles which can cause cracks. 2. Look for the jiggle. Do not over bake your cheesecake. Test for doneness by gently shaking the pan or touch the centre with your finger. The centre should be jiggly. Don’t worry, it will firm up as it cools. 3. Say no to sharp objects. Never insert a toothpick or fork into a cheesecake to test for doneness. Unless, of course, you want it to crack. 4. Temperature is key. Ensure that all your ingredients are at room temperature prior to mixing. Mixing cold cream cheese is never fun and over mixing the batter causes cracks. 5. Watch for quick temperature changes. Some recipes say to leave the cheesecake in the oven for 30 minutes after you turn it off. A drastic change in temperature can cause it to crack. 6. Cracks happen. Don’t sweat it. Use the crack as a starting point for cutting the cheesecake or cover it up with a yummy topping. No one ever has to know. 7. Try a bath. Consider baking your cheesecake in a water bath for a creamy, crack-free cheesecake. 8. Know your recipe. Read the recipe carefully and then read again. You don’t want to mess it up because the ingredients aren’t cheap. 9. No peeking. Fight the urge to open the oven to take a look at your cheesecake. A temperature change can cause it to crack. 10. Use a springform pan. It’s so much easier to remove the cheesecake. 11. Chill first. Refrigerate your cheesecake after its cooled off for a few hours until chilled. Do not cover it until it’s chilled because you’ll end up with a pool of water on top. 12. Loosen it up. If your cheesecake has a side crust, cool it for 30 minutes and then run a butter knife carefully along the side of the pan to loosen it. Don’t remove the springform pan yet though. After its chilled, loosen the crust again and then remove the pan. 13. Slice cleanly and easily. Dip your knife in water before cutting into your cheesecake. Clean it and then dip in water again for every cut you make. 14. Know how to store. Cheesecake will keep in the fridge for three to five days and in the freezer for three to four months. 15. The thawing process. Thaw a frozen cheesecake in the fridge for four to six hours. Remove the wrapping once its thawed completely. I have a bunch of cheesecake recipes including many with a fun twist! Check them out. Do you have any other cheesecake tips and tricks to add? Cheesecake is by far my favorite thing on planet Earth! I love Cheesecake and using a springform pan really works great and baking your cheesecake in a water bath really does make sure your cheesecake does not have cracks! I have just read your Cheesecake tips and I am so glad I have done so. I will probably read them again before I make another cheesecake. As you said, the ingredients are expensive and it pays to be careful with the preparation, baking and cooling. Thanks to your post, I will have a better idea of what to do when making a cheese cake and baking it.